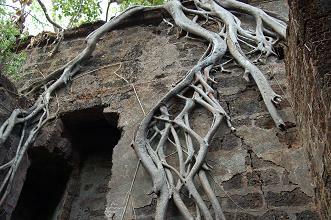 Just over the Goan border, Redi Fort (or Yeshvantgad Fort) is a magical, tree-entangled ruin that looks out over the scenic beaches of the south Maharashtran coast. The fort is approached via crumbling gateways leading through the surrounding forest, and past a deep trench that surrounds part of the structure. Once at the main entrance you will pass through several small rooms and corridors, where tree roots cascade over the walls like Rapunzel's tangled hair. These lead to the huge, roofless inner chambers of the citadel that have long since yielded to nature. Rarely visited by tourists it is easy to spend hours wandering around this lost fortress. Nothing is here to disturb the silence but the calls of a patrolling troop of langur monkeys, or the sound of the drongo birds. Redi was built by the Marathas in the sixteenth century and was later captured by the Portuguese in 1746. 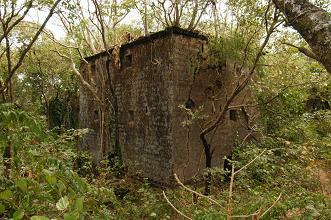 The previous citadel holders, the Sawant clan of Maharashtra, were desperate to regain the fort because of its valuable strategic position on the coast. An attempt to recapture Redi fort was preceded by poisoning the Portuguese garrison's fish supply, but the attack was unsuccessful. Redi was eventually returned to the Sawants following a peace treaty, but the success was short lived - in 1765 the fort was captured by the British who later sold the land to local people in 1890 while retaining ownership of the fort walls. To reach the fort from Goa, you need to arrange your own transport, whether it is by hired scooter or by taxi/rickshaw. To reach the fort you must get to Keri beach, in north Goa (follow the link for directions to Keri beach). Cross over the Tiracol river on the free car ferry that leaves from Keri's small port to Terekhol village. Instead of ascending the hill towards Terekhol Fort, take a right turn in the village and continue along the road as it winds up over the hill behind. You will pass the unattractive USHA pig-iron plant. After 3 km or so, you will need to take a left turn at the junction. Go straight down the road for 4/5 km towards the sea. When the road turns sharply left continue straight down the narrower road for 1 or 2 km. You will see a sign to Redi Fort, taking you right. The road ends as the lane narrows and forks, and you will have to continue on foot, taking the right lane. Any traveller's to Redi should take plenty of petrol and water, since fuel stations are few and far between, and there are no amenities at the fort. 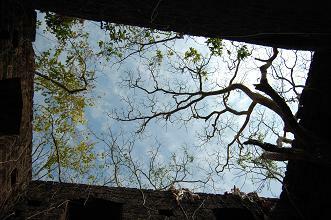 Travel south over the Chapora river to the hill top ruins of Chapora Fort. 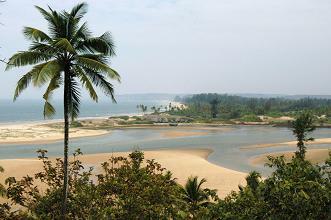 Home of jackals and circling kites the fort commands stunning views over the mouth of the river and Vagator beach.